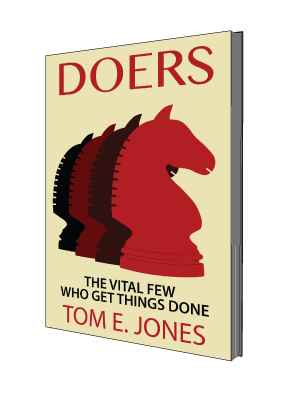 Doers are those disruptive game-changers in every organization who are simultaneously envied by coworkers and feared by competitors. They provide the initiative for new ideas and the energy that drives productivity. Result oriented, they work diligently and attract the attention of their superiors, subordinates, and co-workers alike with their awesome outcomes. Reach across departmental boundaries to build coalitions. Motivate others by enjoying what they do and having fun doing it. Operate intuitively with little direction and limited supervision. Accept challenging assignments that others cannot or will not do. Seek opportunities to grow personally and develop professionally. A Midwest manufacturer converted $800,000 in monthly product waste into an equivalent amount in new sales by forming a Doer-guided process improvement team. Their recommended changes in the production and engineering departments resulted in a significant contribution to the bottom line. A public sector Family Support Division formed a cadre of Doers into a performance management team to provide performance coaching. Their performance ranking rose from 52nd to 1st among 53 comparable agencies. This astonishing 491% improvement won national and statewide recognition. (1) Doers resist authority, question ambiguity, and challenge inconsistency. Such behavior is a prime example of how stressful and demanding supervising Doers can be. They tend to ignore instructions or modify directives whenever they believe their way is better. Some judge such behavior as disrespectful, while others consider the potential benefit of receiving honest feedback from those who do the work, are closest to the customers, and in the best position to solve the problem on their own. (2) Doers risk losing personal influence and effectiveness when promoted. This is a classic example of the Peter Principle that says, “One can become incompetent through promotion.” To counteract the negative effects of advancement, it is essential to tailor recognition and reward systems for Doers based upon their proficiency rather than on their position. Thus, allowing them to reach full potential without having to move out of their productive zone. (3) Doers are easily dissatisfied and seek new opportunities when bored. This is the most critical factor in keeping Doers from jumping ship when they feel their contributions are undervalued or unappreciated. Doers keep their resumes up to date and network with peers to stay current on job openings. Doers thrive on difficult assignments yet lose interest when given repetitive tasks that offer little variety or challenge. Perceiving the lack of potential for professional development, Doers will seek such opportunities elsewhere. A reaction to such disparate behavior can range from fascination to frustration, which is why working with Doers, is always a learning experience.